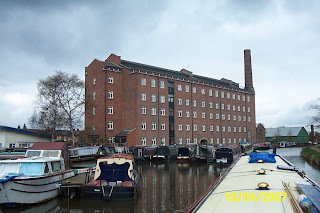 Quick visits to the paper shop and Kings Lock Chandlery meant that we left today at about 09:45. We followed an Anderton boat down the locks, they are due back to the boatyard tomorrow after a week spent on the Cheshire Ring. 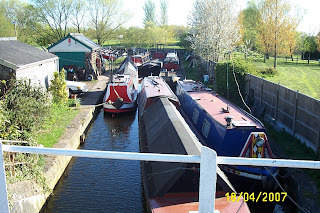 Lock 74 and Andersen Boats hire base. They were not the only boat moving in Middlewich, there were several boats in each direction, but no-one to share with when we got to Big Lock. Such is life. A gentle cruise along this very attractive stretch north of the town brought us to Billinge Green Flash, where we’ll stay for the weekend. Planning application for a marina here has recently been declined. It would be a shame to develop such a pleasant spot. This wreck doesn’t get better with time…. 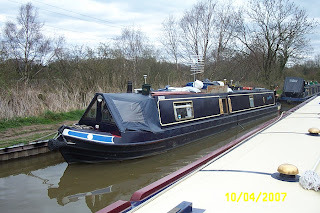 On Monday we go the last mile to Orchard Marina, where we’re booked in for bottom blacking, and I’m going to make some changes to the interior layout. Watch this space! 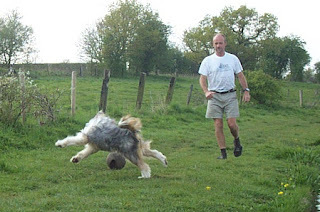 Spent a bit of time playing football with Meg. She cheats! The weather is staying much the same, still bright but cool in the breeze. We got away at 09:50, straight into the first lock of the Wheelock flight. 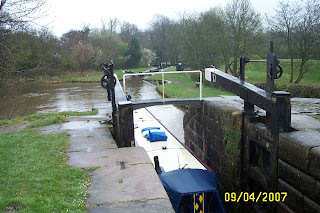 Despite most of the locks being against us, we arrived at Wheelock at around 11:40. Lock 66 Used the facilities, and topped up dog food stores at the pet supply shop, then set off. We were following another boat who weren’t in any hurry, but nor were we, having planned to stop after about an hour. 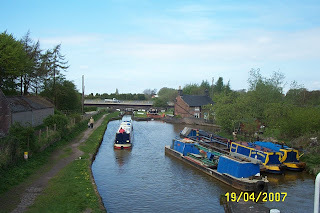 As the weather was so good though, we decided to press on to Middlewich, arriving at about 15:30. Tried the fish and chips near the lock again, the last time they were a bit ropey, I’m pleased to say they’re back to their normal standard. Another bright and breezy day. Went back up to Hall Green on my morning run, and had a chance to say cheerio to Mike and Liz on NB SNECKLIFTER before they set off for Harecastle Tunnel and points south. We moved off from Church Lawton around 09:45. Fairly busy with boats for a start, then quieter later. Came upon the working pair Mountbatten and Jellicoe near Snapes Aqueduct, and took advantage of 48p/litre for the red stuff to fill up. 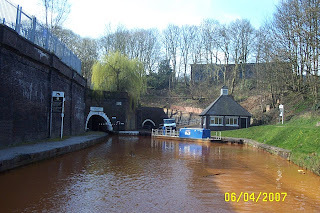 While chatting, we found out that these boats have the distinction of originally working on the River Weaver, and were the first commercial carriers to use the newly restored Anderton Lift, carrying lock gates for the T&M. I calculate that we’re still running at around 1 litre/hour. 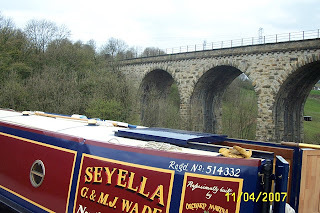 We moored near bridge 148, just below Hassel Green, at around 13:30. 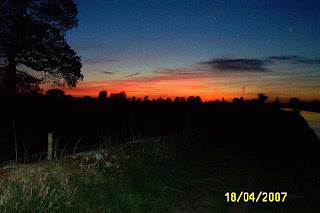 A fine evening, with a beautiful sunset. Off from the mooring at 10:15, and then stopped after 15 minutes to go shopping in Scholar Green. 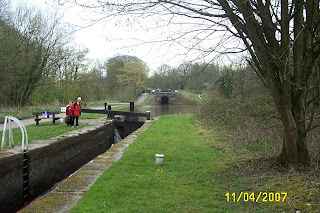 Then off to and through Hall Green stop lock, arriving at Hardings Wood junction at around noon. 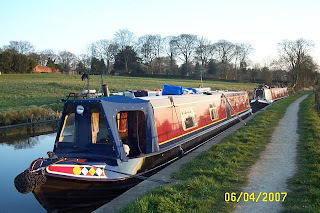 I’d seen the Rev Reed’s hotel boats (from an item on “Waterworld”) moored near Church Lawton on my morning run, and we arrived at the junction in time to see them negotiate the tight turn onto the Macclesfield Canal. Hotel boats "OAK" and "ASH"
Down through the 6 locks of the Red Bull flight, and moored for the night just above Church Lawton. The day has been bright but with a cool breeze. I’ve resorted back to jeans for today! 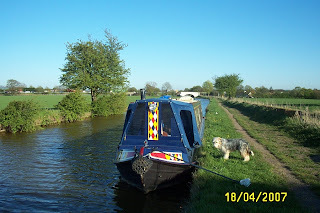 We stayed put for Sunday, I took advantage of the fine weather to scrub the roof, wash the towpath side of the cabin, and polish a bit of brass. The gentle tap of a marine diesel on tickover at around 06:30 was SNECKLIFTER moving off down to the locks. Overnight the fridge had shut down due to low voltage, which was a surprise considering the length of time the engine has been run recently. I’d checked the batteries yesterday so knew they were OK, so fired up the engine to check the charge rate. This was well down, less than 10 amps. The problem was a loose connection on the primary charge wire on the alternator, putting a high resistance in the circuit and causing heat which charred the insulation. After restoring this and another loose terminal, the charge rate returned to 40 – 50 amps as expected. 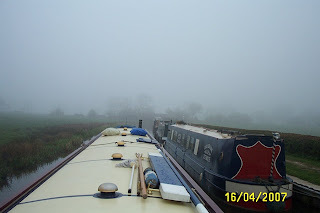 After this remedial work, we got away at just before 10:00, down to the top lock of the Bosley flight for water and services, in cool, misty weather. Had to fill most of the locks before passing down, but even so we cleared the bottom lock by 10 to 12, and stopped for lunch just past the lock landing. 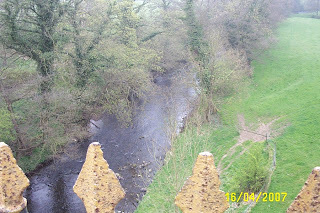 View from the Dane Aqueduct. The weather started to clear soon after lunch, leading to a fine, sunny afternoon, but cooler than the last couple of days. We passed SNECKLIFTER just before Congleton, we’ll probably not see them again as they head south down the T&M when we head north. Stopped for the night near bridge 86, where we spent the Easter weekend. Broke the Golden Rule today – never travel at weekends, especially if the weather is good. So, what can I say about today’s trip? 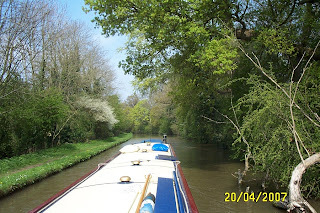 Met lots of boats – those going in the opposite direction always seemed to appear at a bridge, narrows, or shallow corner. I can’t remember how many times we ran aground. Those going in the same direction always seemed to want to go that little bit faster than us. This makes me uneasy, I feel I should go that bit faster than I am comfortable with. I’d normally wave boats past, but it’s not easy on this canal with such shallow margins. Had to clear the prop of rubbish twice, not including being able to spin it clear with a quick burst in reverse. I’ve got a heap of plastic, twine, fishing line and carrier bags, sitting on the aft swim, waiting to be bagged and disposed of. Nearly trapped a car between the 2 barriers on a lift bridge, should have read the instructions more thoroughly…. A long queue in Bollington Co-op for a newspaper. But the plus points… It has been a beautiful day, so I can’t honestly begrudge those boaters who can only get out at weekends. 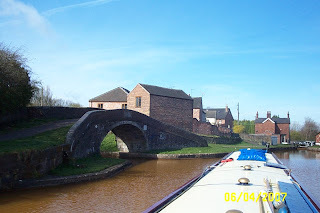 And we moored not far past NB SNECKLIFTER (see previous post) in a lovely spot about ½ mile before the Bosley flight of locks. I took the opportunity to go and have a chat. 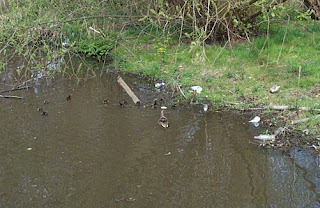 Saw 3 lots of ducklings, the biggest family being 15! I wonder how may will survive. Oh, and I finished the decoration on the cratch board last night. We’ve decided not to move tomorrow. The roof needs a good scrub, and the brasses need cleaning. Any excuse, eh. Another “2 for the price of 1” entry, today. After a quiet night on Wednesday, Mags sister Dot, and her husband John arrived around 11:00. Caught up with the news and took delivery of prescriptions, a package of running gear (including some new shoes) for me, and some cable I’d ordered to connect up the inverter remote in the galley. Thanks again, Dot. 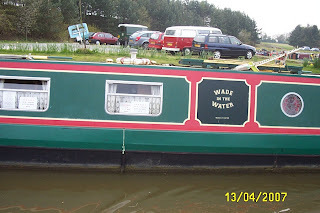 Dot took Mags shopping to Asda, while John and I spent the time chatting and boat sitting. 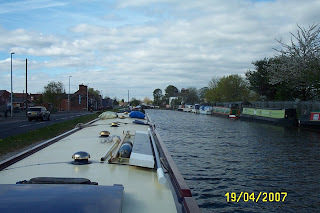 We untied around 16:00, up to the junction to turn around and back down to the lift bridge where we transferred a car boot full of supplies onto the boat. 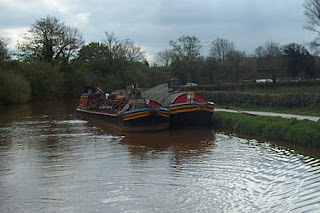 Then we said our goodbyes and set off back towards Marple. We stopped for the night, after a couple of stops to clear the prop, just after Hyde Bank tunnel. A couple walking past as we were tying up told us we had stopped in a magical place. I have to agree. 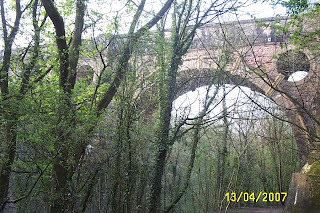 The slopes of the Goyt valley are full of birds and other wildlife, and the architecture of the aqueduct and adjacent railway viaduct is really impressive. Overnight near Hyde Bank Tunnel. 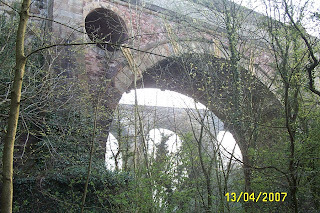 Views of the aqueduct and viaduct. 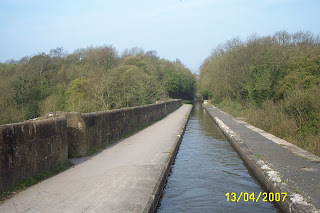 A bright morning this morning saw us heading off for the 10 minutes to Marple Bottom Lock. We had a really good run up the flight, with most of the locks in our favour and not another boat, apart from a BW workboat setting off for some tree trimming, to be seen! 2½ hours from bottom to top. And here I have an apology to make to any “Marple-ites” I may have offended by my comment on the last post. The flight is really attractive, well maintained and with well manicured sides. The lower half runs out into the country, while the upper section climbs into the town. As you enter the town from this direction, you see an entirely different aspect, giving a far better impression. Coming up Lock 13 We used the Sanitary Station at the junction, then through the “not so nice” bit on the Macclesfield and out into countryside again. On through Poynton, busy with boats and towpath walkers. Moored for the night between Br 19 and 20, a pretty spot but also a popular one. We’re one of 4 boats here tonight. Spotted at Lyme View Marina, maybe we should have bought this one…..? A quiet night, and an early start planned. But plans don’t always work out. I’d found out yesterday that we need an anti-vandal key for the last (lift) bridge before Duckinfield Junction. So I had a walk into Marple first thing, and had a chat with a BW guy about where to obtain one. 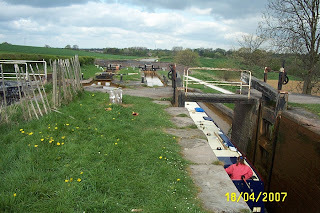 Then back to the boat to make phone calls to check that I could get one before committing us to the Marple flight of 16 locks. 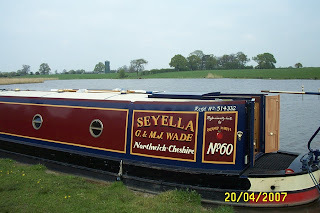 I found I could get one at Portland Basin Marina, so arranged to collect it when we arrived at the lift bridge. We finally got away around 09:30, and entered the top lock at 10:00. After a good run down, we were clear of Lock 1 at 12:30. Part way down, there's this curious pair of tunnels under the road. The one on the left for the horse, the higher one on the right for the boatman. 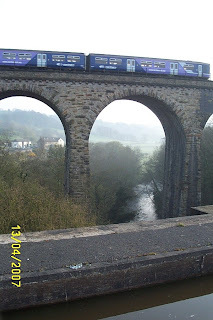 Marple railway viaduct from Marple Aqueduct. The first couple of miles, on the embankment above the Goyt valley, is attractive, But unfortunately it’s all downhill from here to the junction. 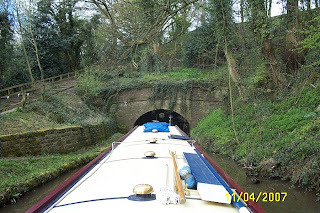 Overhanging trees, low bridges and tunnels and lots of rubbish in the water. 2 highlights, though. A heron that was confident (or hungry!) enough to hang on till we were alongside before taking off. And a family of ducklings, the second I’ve seen in 2 days, but the first I could capture on “film”. After what seemed a long day (the trips down the weed hatch didn’t help. I think I’ll rename it the poly bag and baler twine hatch), we arrived at a suitable overnight stop just short of the junction, overlooking the Tame valley. Lots of people around, walking dogs etc. We'll see Mags' sister , Dot, and brother-in-law tomorrow. Away from our overnight stop at around 09:30. Grey and overcast, but with a promise of sunny periods later. Bosley Lock 6 and The Cloud. 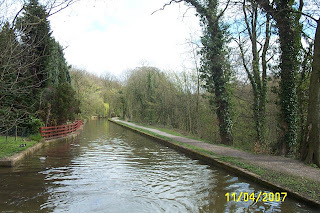 The canal remains attractively rural, even Macclesfield and Bollington don’t intrude too much, being mainly below the canal level. 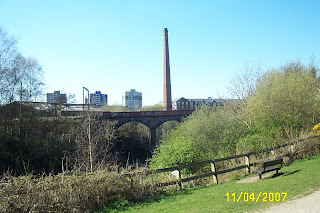 Hovis Mill in Macclesfield. Now desirable canalside apartments, of course. 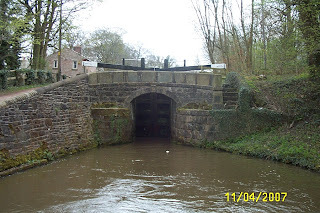 The navigation maintains this final lock-free section by driving through deep cuttings and across embankments and aqueducts. The edge of the Peak District is a constant presence to the East. 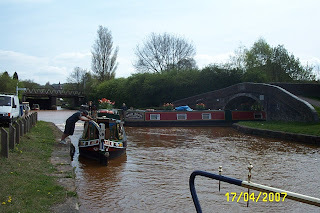 Quite a few boats moving today, we seemed to meet each one at a bridge or narrow section. The 2 swing bridges were easy, though. The first was operated by the crew of a preceding boat, and the second was left open. No problem there, then! 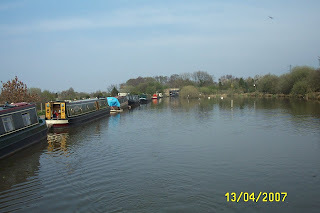 Passing Lyme View Marina, near Poynton, Mags spotted a couple of Orchard boats. One was No 59, on sale earlier this year. 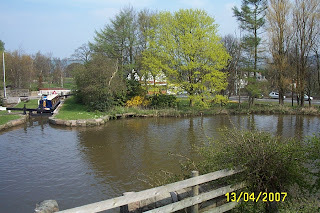 We stopped about a mile short of the junction, on the edge of Marple. 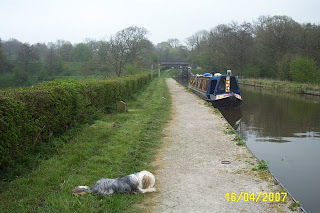 I took Meg for a walk up to the junction, but couldn’t get to the locks on the towpath due to construction work. 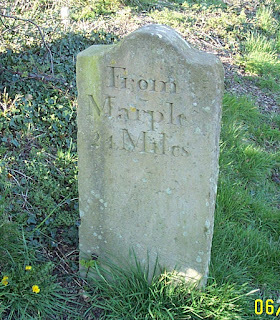 Not impressed with Marple, at least from this stretch of canal. It seems to be one of those towns that shows its bum, rather than its face, to boaters. Near Bridge 19, we passed NB “Snecklifter”. 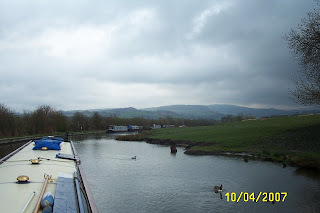 Mike and Liz’s narrowboat blog was the first I came across, and the inspiration for this journal. An unusually fine Easter weekend! Pretty busy with boats up and down the canal. We stayed put, not wanting to add to the congestion. Spent the time running, walking Meg, and pottering about on the boat. 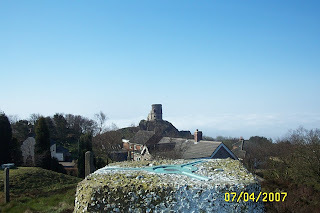 Mow Cop Folly from the trig point. 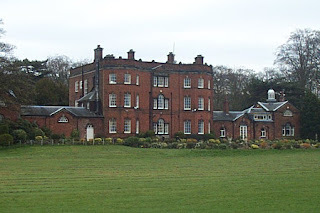 Ramsdell Hall, just down from the mooring. Set off today at around 09:00, trying to miss the rush. In fact there seemed to be less activity today. Through Congleton just after 10:00, not as bad as we’d been told, in fact quite pleasant apart from a short section near the railway bridge on the north side of town. 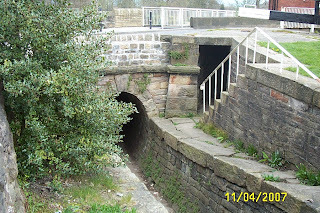 The towpath changes sides twice in the town, using these “snake” bridges to allow the horses to cross the navigation without unhitching. We pressed on and arrived at the bottom of the Bosley Flight not long after 12:00. We’d decided to stop for lunch, and to let Meg “ablute” before tackling the 12 locks. The decision was reinforced by the light drizzle that started to fall as we arrived. 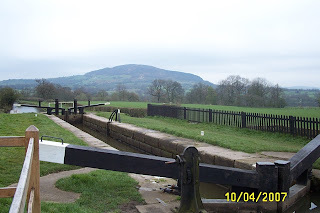 The setting for these locks is very attractive, with an aqueduct carrying the canal over the River Dane, and The Cloud looming on the horizon to the South. We hung on for about 45 minutes but the weather showed no sign of clearing, so we decided to move on anyway. 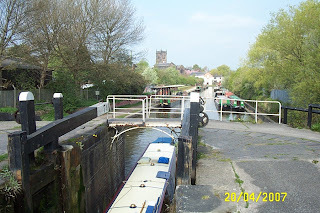 With the occasional boat coming down, most of the locks were in our favour, and we reached the top just before 16:00. 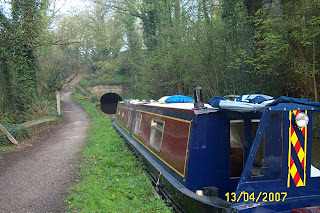 After making use of the sanitary station and water tap just above Lock 1, we moved on for another ¼ mile and found a spot to moor at the end of the long term moorings. We're now around 500 feet above sea level. Good Friday today, and it was, too. Got up at 06:30 to go for a run, the first since Liverpool a week last Sunday. Feeling fit and strong, just need to concentrate on maintaining speed now, to get a good result in Manchester on the 20th. After laying the fire ready for lighting when we exited the tunnel, we set off. Arrived at the south portal at around 09:25, and went straight in. 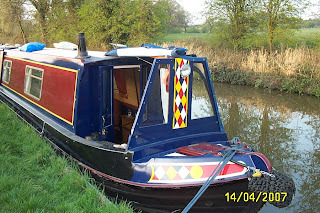 Out again 40 minutes later, and pulled on to the services mooring. 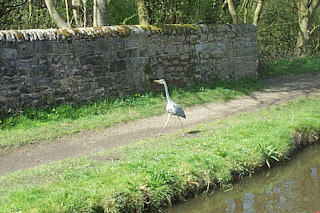 After emptying the loo, moved on up to Hardings Wood Junction and turned onto pastures new on the Macclesfield Canal. 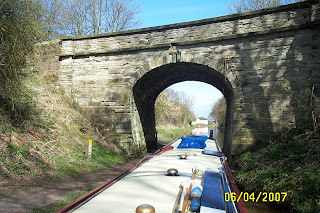 Leaving Harecastle Tunnel. You can just see the old Brindley tunnel mouth behind the BW van. 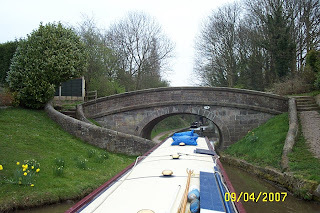 A right turn at Red Bull took us over Poole Aqueduct back over the Trent and Mersey. T & M from the aqueduct. The 1 foot rise at Hall Green Lock didn’t take long to pass, we filled with water just above the lock and carried on up the canal to just before bridge 86 where we stopped for the day. Another day with a cool misty start and a fine sunny finish. We spent 15 minutes watching a kestrel looking for his tea this evening. 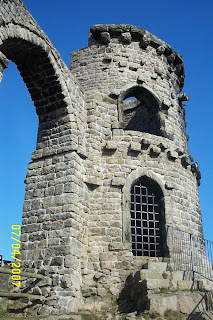 First impressions of the Macclesfield…. Very pleasant. If it continues as good as this it’s going to be a really good trip up to Manchester. And the milestones resemble tombstones!